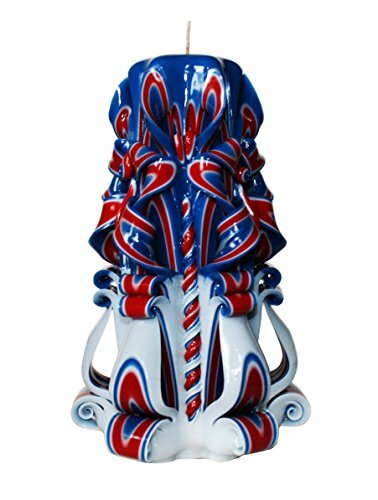 Construction Material: Paraffin wax and glaze Color: Red, blue and white Features: 100+ Hour burn time Product Weight: 30.8 oz Dimensions: Height 8 inch Width at the base: 3.5 inch Width of the top: 2.0 inch Overall Product Weight: 4.0 lbs Country of Manufacture: United States No returns accepted. The damaged candle is not our but post office fault. In this case we happy to replace candle and send it ASAP. If you have any questions about this product by Carved Magic Candles, contact us by completing and submitting the form below. If you are looking for a specif part number, please include it with your message.